Most of the time, conducting a survey is a fairly standard process: You assemble a set of questions to ask respondents, cajole them into taking the time to answer, and then dive into the results to discover tiny flashbulbs of enlightenment that help you make better decisions. That’s great – but sometimes we can do more than the basics. Among the slightly-more-advanced features to add to a survey is data pre-population, sometimes called pre-filled data population or auto data population. 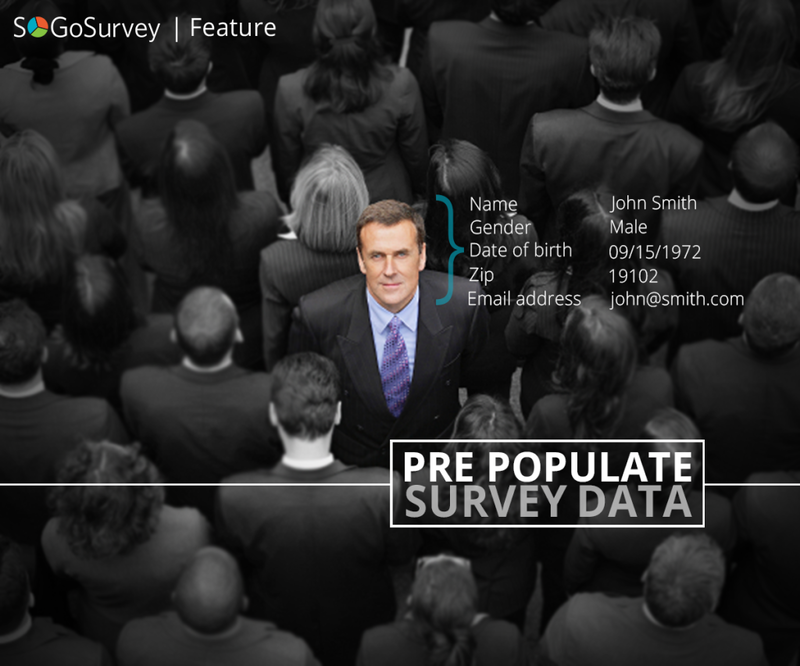 As the term implies, data pre-population lets you add known data to a respondent’s survey results. The premise is that you already have information about that individual, so there is no reason to ask the respondent to re-enter it. You start with data that’s already associated with the survey participant. Commonly this includes name, age, job title, and other demographic data. For example, you may draw from student records (name, classes taken), sales data (items sold, invoice date), or information gathered at an event (registration at a trade show booth). 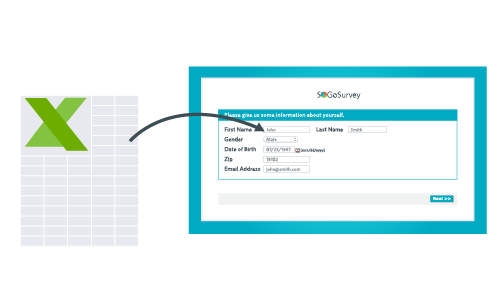 When you create the survey, you add the relevant data fields to the design. This data may be set to be visible or invisible; if visible, you can control whether the respondent can edit it. The survey invitation may include an identifying record that associates the respondent with the relevant data. When the respondent submits the survey, the pre-populated data is included with the rest of the survey results. For example, let’s say you’re creating a survey to measure customer satisfaction, which you plan to send two weeks after a product purchase. The basic way to design such a survey is to ask questions like, “Which model did you buy?” and “From which dealership did you make the purchase?” Then you ask the customer how happy he is with your product and service. And there’s nothing wrong with this process! It works great. But we can make it better. You’re already consulting a sales database, which is how you know it’s two weeks post-purchase. That database includes the dealership, item category, specific model, and perhaps serial number. Use that information! Data pre-population can streamline the process. Why ask the respondent to tell you things you already know? Besides, if the individual bought a washing machine two weeks ago, he might remember the brand name but not the model number (and why should he?). Staring at the question and thinking, “Beats me!” encourages the customer to abandon the survey. Or he might guess at the model number – incorrectly; the result is you make decisions on inaccurate data. It makes the survey shorter. There’s no need to ask questions when you already know the answer. It increases data accuracy. The respondent may not recall which model of espresso machine she bought from your company, but your sales records already stored that information. Why take the chance of her misremembering? Or dropping out of the product satisfaction survey when she realizes she doesn’t know? It prevents you from having to ask “prying questions.” Respondents are more likely to confirm demographic data you provide to them (especially since it’s most likely accurate) than to share it openly. …all of which improves response rates. Pre-populated and hidden: The participant never sees the data, but it’s available when you run the reports. For instance, you might include the salesperson’s ID as a hidden field; the respondent doesn’t know or care, but tracking that information helps you correlate customer satisfaction by employee. Pre-populated, visible, not-editable: You present the information to the respondent, without permitting her to change it. The respondent cannot change the item. For example, you might include, “Thanks for buying the LG 4021! We have a few questions to ask you about how you’re using it.” Then, too, you have the model number in the survey data, which helps you dive deeper in the analysis phase. Data pre-population works at two stages of survey design and deployment: at the invite level (think of it as a mail merge feature) and within the body of the survey. These can work in concert to improve relevancy and engagement. For instance, you can include branching that works on hidden data, without adding extra filter questions. Using the data you already “know,” you can direct respondents to the right section – without asking for their input. To continue our example of the two-week post-sale follow-up, let’s say your customer relationship management system stored the product category, brand, and model number purchased. If you use data pre-population, you don’t need to ask, “What type of product did you buy?” in order to properly branch to the relevant survey section. A customer who bought a dishwasher can be presented with relevant questions (about, say, the difficulty of plumbing installation) that are not shown to someone who bought a microwave. That’s really powerful. And yet, you can do even more. The SoGoSurvey Enterprise subscription adds another level of data pre-population by letting you pull data from previous surveys and compare it to current results. This is immensely useful for follow-ups, compliance surveys, and tracking trends. For instance, contemplate the possibilities from problem resolution. Here’s a scenario: A utility company might do a customer satisfaction survey after a repair appointment, and learn that Joe was unhappy with the quality of service. The utility company might use an automatic email alert to let management know about Joe’s dissatisfaction and (we like to think) take action on it. Again, this ensures data accuracy and it minimizes the number of questions you need to ask. But it also creates opportunity for tracking overall trends. If you regularly survey several government agencies, you might be able to report on overall progress by area of compliance. A series of surveys of healthcare organizations might gather useful information about how long it typically takes an organization to reach compliance with a new requirement. And so on. I certainly hope this overview helped you learn something new. If you need help learning to take advantage of these features in SoGoSurvey, remember that we have live tech support, around-the-clock, with people who are happy to assist!